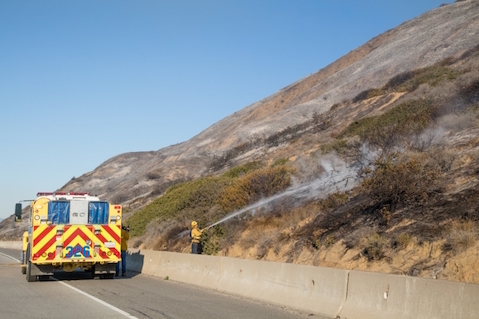 Firefighter putting out a hot spot along Highway 101 on Saturday, December 26. The Solimar Fire on Christmas night left hundreds of acres of scorched earth along hillsides above Pacific Coast Highway and the Union Pacific Railroad in Ventura County, prompting emergency-response teams to prepare for rain-soaked landslides as 2016’s debut storm descends on Southern California this week. While the Ventura County Fire Department dropped off 2,000 sandbags for Solimar Beach residents, Caltrans has lined the highway’s northbound shoulder with 500 feet of concrete K-rail and cleared numerous drainages coming off the steep watershed.The state’s transportation agency will also have a storm crew on call around the clock, according to a spokesperson.